Char-Broil; however, all thoughts and opinions expressed are my own. This past weekend was one of my favorite days of the year. Nope, not Halloween, Thanksgiving or Christmas. Nope, not my birthday, either. It was the day we finally de-winterized our back deck! We pulled out all of our couch cushions. We swept off all of the dead leaves. We even got some new throw pillows for the chairs. And, most importantly, we got a new grill! Spring is all about resetting, cleaning and starting anew…and after this weekend, our back deck is now officially open for summer picnics, parties and general relaxing in the sun! 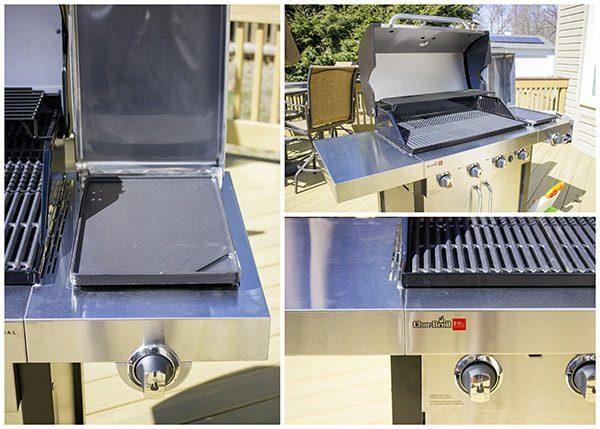 This year, we decided to upgrade our gas grill to a new Char-Broil TRU-Infrared 4-Burner Grill. 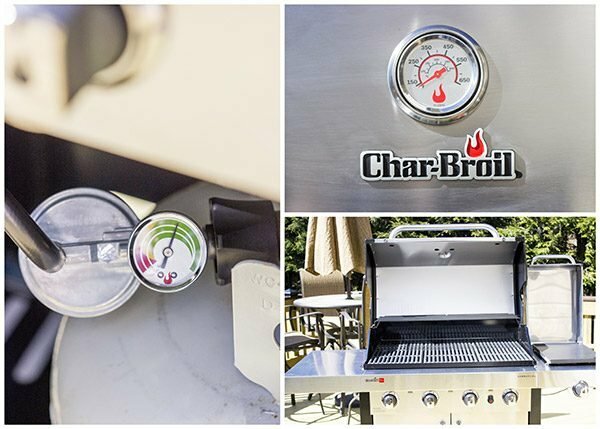 We’ve been Char-Broil fans for a while, and this grill is incredibly easy to use. Wonder how to get amazing grill marks while still keeping your grilled food juicy? Char-Broil’s TRU-Infrared cooking system is the answer! Seriously. I grill a lot, and the design of this grill is downright awesome. Traditional grills heat the air, and this hot air is what cooks the food. However, the infrared system utilizes radiant heat energy which leads to juicier foods on the grill. 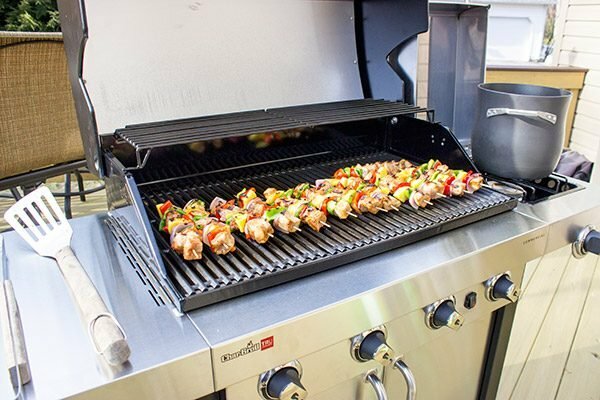 What’s more, the TRU-Infrared cooking system means even heat across the entire grill. No more hot spots to avoid! And because of the design of the TRU-Infrared system, you won’t have any flare-ups, either. Raise your hand if you’ve looked away while grilling only to look back and see a big flame engulfing your burger, hot dog or steak? *Raises hand* Yup, been there, done that…in front of a bunch of friends, too. Oops. Char-Broil’s TRU-Infrared system sits above the heat source and redistributes the heat evenly across the surface of the entire grill. As you guys might remember from summers past, we grill out 4-5 nights a week during the summer. And, friends, this infrared cooking system works. Trust me! Do you guys and gals host a lot of summer parties? Laura and I love inviting friends and neighbors over for casual dinners on the back porch. But as we all know, the food is the centerpiece of a summer grilling party. We love a grilled burger, but I decided to go with Grilled Pork Kabobs for the first meal on our new grill. And they turned out amazing! Our grocery store had pork tenderloins on sale last week, so I grabbed one and then chopped it up into cubes. I marinated the pork for a couple of hours and then threaded it onto skewers with onions, peppers and some pineapples in there for fun. (Grilled pineapples are amazing!) I’ve gotta say that these Grilled Pork Kabobs were a winner, and I suspect we’ll be grilling these again in the near future! Wouldn’t you know it, but as I was setting up our deck, I noticed that the propane tank was almost empty. I attached it to our new Char-Broil grill, and we got about halfway through cooking our Grilled Pork Kabobs when we ran out of propane. This grill has a handy fuel gauge, and sure enough the fuel was empty. But I always keep a spare tank on hand, so I switched the tanks out and kept on going with no problem at all. I gotta say, though, the fuel gauge is really helpful for knowing when it’s almost time to switch in the new propane tank! I know grilling can be intimidating, especially if you didn’t grow up using a grill very often. But the Char-Broil TRU-Infrared line of grills takes the scary out of grilling…seriously! You have less flare-ups, and the food cooks more evenly. The TRU-Infrared system features 443 tiny stainless steel burners, and that means the ultimate level of temperature control! And those 443 tiny burners are covered by porcelain-coated cast iron grates which in turn means no exposed holes and easier cleaning. Score! This Char-Broil TRU-Infrared 4-Burner Grill also features 725 square inches of cooking area. That’s a lot of summer burgers right there! If you’re in the market for a new grill, swing by Lowe’s and check this one out! But back to the pasta. I kept it pretty simple and just sauteed up a bit of roasted garlic. Then I added in the cooked pasta, basil and cherry tomatoes. The kabobs on top were the star of the show, and this meal was the perfect way to end our first Spring weekend here in upstate New York! Now it’s your turn! What’s your favorite thing to grill during the summer? I can always use some fun, new ideas! In a small bowl, whisk together all marinade ingredients except pork. Using a shallow dish, add pork cubes and marinade; toss until well coated. 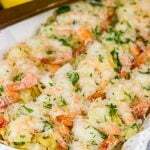 Cover and refrigerate for 2-4 hours. If using bamboo skewers, soak skewers in water for at least 30 minutes. Preheat grill to medium-high heat (~375°-400°F). Thread the pork, bell peppers, onions and pineapples onto skewers. 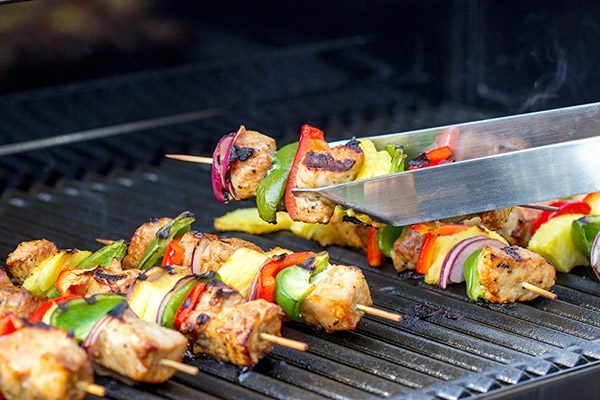 Grill the kabobs over medium-high heat, turning occasionally, for 10-12 minutes, or until pork is fully cooked. Meanwhile, cook pasta according to package instructions; reserve ½ cup of pasta water. Using a large sauté pan, add olive oil and roasted garlic. Cook over medium-low heat, stirring occasionally, for 3-4 minutes. Add the cooked pasta, tomatoes and sliced basil. (If necessary, add ~⅓-½ cup of reserved pasta water to loosen pasta at this stage.) 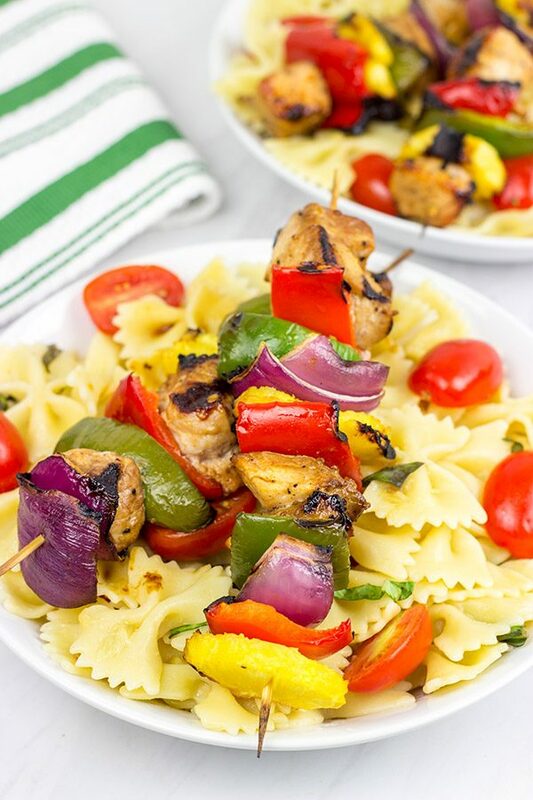 Divide pasta onto plates and top with freshly ground black pepper and two grilled pork kabobs before serving. I often keep roasted garlic in the freezer as an easy way to flavor pasta, soups, etc. It's easy to make, and it's a huge flavor booster! If you don't have any roasted garlic on hand, then check the olive bar at your local grocery store. Many stores have an olive bar in their deli section, and often roasted garlic is available there. It's an easy way to pick up however much you need for a recipe! These look to-die-for! I could eat veggies and meat kabob style all day long! David, can I just tell you how glad I am to know I’m not the only person who gets excited about things like de-winterizing decks? I’ve been a spring cleaning machine lately and am giddy with happiness over it :). I never, EVER grill because it’s way too intimidating. This has me thinking I need to conquer my fear though. Summer BBQs have always been one of my favorite things so I need to get on this ASAP! Yes! We are definitely kindred spirits on opposite coasts, Kelsie! There is something so refreshing and fun about pulling couch cushions out of the basement. (Geez, I sound like my father…) Oh my gosh, you totally need to practice grilling! It really isn’t that scary when you’ve got a good grill! Hi David. So happy to hear Spring has arrived in your neck of the woods. We grill all year but it is so nice to grill in comfort. 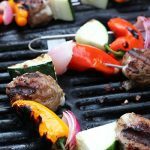 I often buy pork tenderloins and these kabobs are a great place to use them. I love grilled pineapple and I would also add some mushrooms. I never make Kabobs, but I love them so I’m not sure why I don’t. Yay for de-winterizing the deck!! Now that’s exciting. I’m down for resting and starting anew but I’m really not looking forward to any spring cleaning. Your new grill looks awesome! 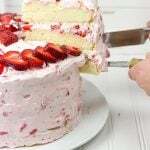 I can’t wait to see all of the tasty recipes you are going to posting this spring/summer. I’ve never used an infrared grill, now I’m dying to try it. These Kabobs make my mouth water. Oh, you should totally make kabobs more often, Mary! The best part is how you can customize them to your favorite flavors. I’m kinda partial to grilled pineapple, so I almost always include those. And bell peppers, too…although red bell peppers taste SO much better than green. Why is that?? This grill is pretty darned amazing, and I’ve got all sorts of grilling recipes up my sleeve now that the weather has finally turned up here in the northeast. You should make it a goal to grill more this summer…nothing beats the flavor of food hot off the grill! 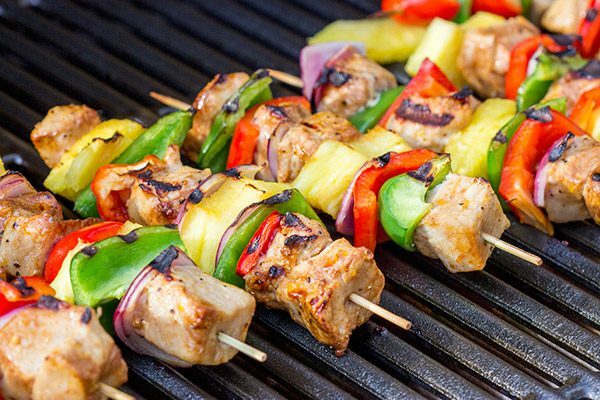 Hooray for that amazing grill…..and these amazing kabobs! Looks like you’ve got a great grilling partner! 🙂 Grilling weather will be here shortly! Yes! This grill really is amazing, and I can’t wait to pull it out again tonight. 🙂 Kabobs are so much fun to grill since you can customize the flavors…and I gotta say serving them over pasta was a fun twist. I didn’t realize that we are running ahead of you in terms of grilling season…I thought we were the last ones! Hah! Thanks, Kathy! David, I half expected to see snow in the nooks and crannies of y’alls deck – but pleasantly surprised that short-sleeve t-shirt weather has finally hit y’all! Yay!!! And about time – eh?! Jumping along to that grill – boy oh boy is that one epic! And that fuel gauge – wow! 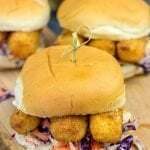 Looks like Robbie is gonna be joining you as a grill master sooner than later 🙂 And dang – I guess I gave up on impromptu grill parties at y’alls place by choosing to stay down here for the next four years 🙁 Dude – I love the combo of pineapple and pork and that marinade sounds like it would marry these two together perfectly! So this grill really is epic! I can’t wait to pull it out again tonight! 🙂 And Robbie was so interested in looking at the food on the grill that Laura had to snap a photo. Of course, he wouldn’t eat it when we tried to give it to him for dinner…but such is life with a toddler, right? Also…who says you have to stay down there? Sure, Lil Shashi is in Athens, but she’ll be busy with school and friends. Come on up here and pass the days with us! But beware…I might put you to work as a taste tester! Haha! Thanks, my friend! Oh no! I hope I didn’t make you even more jealous about warmer weather, Dawn. I always think we’re one of the last ones to warm up, but then I remember my Canadian friends. Warmer weather is coming soon…I promise! So I gotta say that I’m loving this new grill! We’ve grilled out 3 of the last 4 nights, including one night in a light (but very cold) rain. Haha! And I totally hear ya on the kabobs. They are so easy to mix up when it comes to flavors/marinades. And I gotta say that serving these ‘bobs over pasta was a really fun twist. Happy grilling, my friend! JEEEEZ! Im not suprised your friends and neighbours love coming over with a grill like that and a delightful cook like you to russle up food like this for them! Those kabobs look incredible! You have me all sorts of excited for outdoor cooking on our deck. 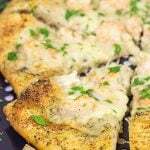 We’ve been putting off getting a new propane tank, but with this recipe making my mouth water – I’m pretty sure we’re going to go out and get it ASAP so we can grill ALL THE THINGS now that it’s finally getting nice out in these parts. 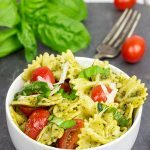 I love that you chose farfalle pasta – it’s easily my favorite pasta type because they’re just so darn cute (and delicious). Yes! Go get that new propane tank right this very minute, Jessica. Just think…you could be out back grilling this weekend! 🙂 These kabobs are just downright fun to make/serve. 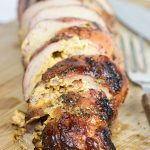 (And you could cut out some time by grabbing a marinated pork loin.) Also, I totally agree with you about the pasta! 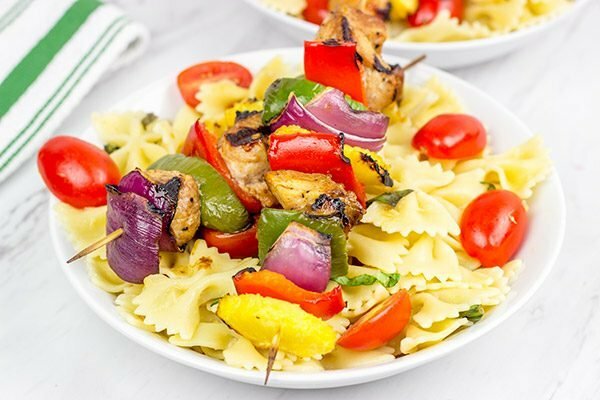 I loved serving the kabobs over pasta, and farfalle is an excellent choice for summer pasta. Plus, it’s just fun to say farfalle. Haha! Thank you so much for the kind words, my friend! We thoroughly enjoyed last weekend as well – the weather was incredible and it was also our first weekend this year where we took out our couch cushions and relaxed in the spring sun. 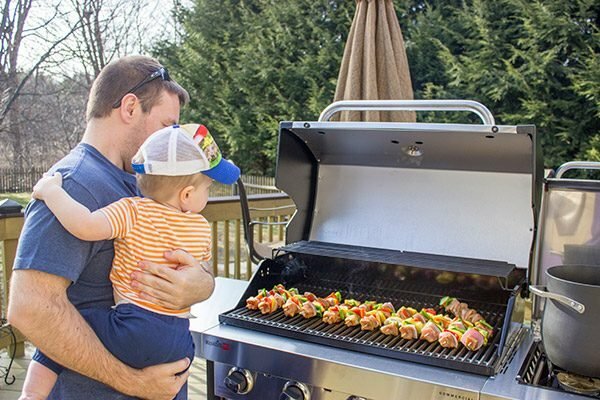 Your new grill looks amazing – I am sure my husband would love it! Hopefully, the weather will be good over the Easter weekend – your recipe comes at the right time! Those grilled pork kabobs looks insanely delicious 🙂 Have a great Easter break, David! What a gorgeous grill! And you did an amazing job with that pork. I always worry about pork on the grill because it dries out so easily. But yours looks juicy and delicious! Why thank you very much, Marissa! I have loved playing with the new grill. It was quite warm here yesterday (randomly), and we totally had the grill out and cooking away. 🙂 Definitely try using pork tenderloins in kabob form…they don’t take that long to cook, and the flavor is amazing! (Oh, and serving the kabobs over pasta is my new favorite trick. Yum!) Hope you had a great Easter weekend, my friend!